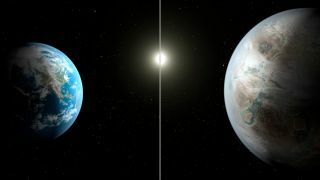 The artist's illustration compares Earth (left) to the newly discovered planet, Kepler-452b, which measures about 60 percent larger. Image released July 23, 2015. Planet like an older Earth is found, Stephen Hawking signs on to an ambitious search for extraterrestrial life and a faulty strut is proposed as the cause of SpaceX's rocket explosion in Space.com's top news stories of the week.